Pearson’s AP United States Government program has been thoroughly revised to fully support the revised curriculum for the 2018-2019 school year. The new correlation to the course framework can be viewed here. New! Test Prep Workbook for AP®—fully revised and rewritten with new exam style practice to prepare students for the AP Exam. AP Exam Style Test Bank is a downloadable resource for teachers within MyLab. 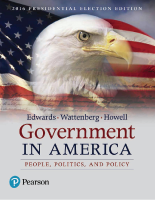 Includes access to MyLab Political Science with Pearson eText. 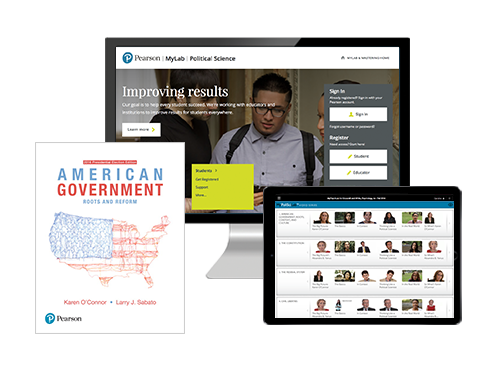 MyLab Political Science with Pearson eText is an online homework, tutorial, and assessment system that improves results by helping students better master concepts and by providing educators with a dynamic set of tools for gauging individual and class performance. Organized to the contents of each textbook and includes interactive Pearson eText. Supports the College Board’s course update with resources including revised correlations, a complete list of Supreme Court cases and their holdings as related to the Enduring Understandings PLUS an AP Exam Style Test Bank for educators. Provides personalized learning to reach every student. Engaging multimedia, animations, videos, and more!